When Arvor’s father Colonel Grendel decides to send him to Caderbrith, a boarding school for dragons, neither he nor his son realise what problems Arvor is going to have there. Arvor really struggles with his school subjects: he is bad at spelling, hopeless at games, terrible at flying and a disastrous fire-breather. The teachers get cross with him, and none of his classmates want him on their team. In fact, he’s quite a disappointment to his stern father. Accompanied by Matt Rowe’s lively drawings, Arvor’s Schooldays is a heart-warming tale that will appeal to young readers of all ages – and shows the value of being true to yourself. 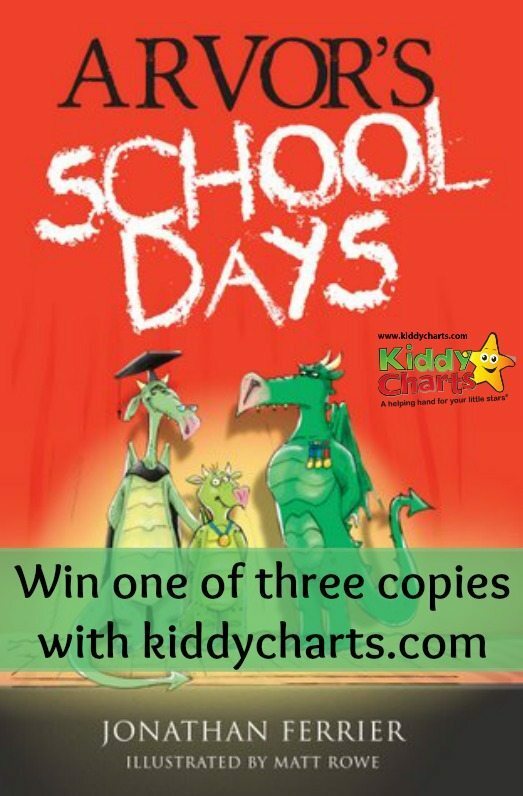 So why not enter and get your very own copy – all you need to do is enter through the widget below. We also have our wonderful KiddyPlay competition running at the moment – every entry gives to charity too. We also have other open giveaways worth checking out too. The closing date is Tuesday 2nd December for this competition, and there are the standard terms and conditions, for our giveaways to pay attention too as well. I liked seeing my friends most at school!! I liked reading time & history. I liked best about school was been with my friends, the carefree freedom days, laughing a lot about silly things, some of the teachers, the learning, getting an A grade, getting 100% on a maths test. When I was at school I loved haing my own little desk with a lid! I used to keep it really tidy inside and had stickers on the lid! I enjoyed school, especially art! My youngest daughter loves art too – she says she loves the paints and glue at school!